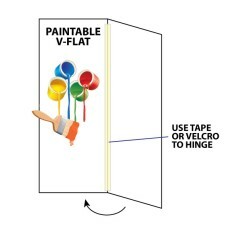 These V-Flats have a paintable white surface. When painted It must be sealed on both sides to prevent bowing or buckling. They are 2400 x 1200mm or 8' x 4' in size. Overall thickness is 20mm. NOTE: These are available for *Brisbane pick up only*.